Each year, many adults who have never been baptized become Catholic. In the United States, these adults are outnumbered by baptized Christians of other denominations who seek to enter into the full communion of the Catholic Church. In the minds of many Catholics—indeed, in many parish preparation programs—there is little difference between the two groups. Baptized and catechized Christians are often placed in programs with those who have not been baptized. Just as often, the two groups are welcomed into full membership alongside one another during the Easter Vigil, thereby obscuring further the distinction between them. Imagine that a high school senior transfers schools and is subsequently placed in middle school classes. Imagine no one thinking this change in status odd. Turner seeks to clarify and confirm the status of baptized persons who enter into full communion of the Catholic Church. In addition, he explores the rites of reception in the early church and the Second Vatican Council’s call for ecumenical dialogue and looks to the reception rites of other Christian communities to gain added perspective. Turner’s historical and ecumenically sensitive analysis will help members of catechumenate teams think more carefully about the baptismal unity of all Christians. Drawing on that foundation of unity, they will find cause for rejoicing and restlessness and will learn steps to avoid and steps to take—so that communion becomes both easier to achieve and a reality in their midst. Paul Turner, STD, is pastor of Saint Munchin Parish in Cameron, Missouri, and its mission, Saint Aloysius in Maysville. He is a member of the North American Academy of Liturgy, which he served as president in 2006. Turner is also author of Let Us Pray: A Guide to the Rubrics of Sunday Mass published by Liturgical Press. By offering the proper contexts in which to understand what we do when we receive baptized Christians into the full communion of the Catholic Church, Turner has challenged us to examine our practices and to move toward rites that better reflect the true nature of what we are doing and in this way to witness to the unity of Christians as it is now and as it is to be. This book will be helpful to RCIA teams, worship commissions, and others interested in liturgy. It should be required reading for every pastor and RCIA director. BAPTISM MAKES IT DIFFERENT! Beware when you read this book! It will change how you implement the Initiation process in your parish. Paul Turner has once again given the Church a masterful book to help all of us understand Baptism and in particular how we are to walk with those who approach the Catholic Church for 'union and communion'. Besides a comprehensive historical grasp of the development of the Rite of Reception into the Catholic Faith, he also provides practical insights and direction for those involved in today's initiation ministry with candidates for reception into full communion of the Catholic Church. No one working in any facet of the Rites of Christian Iniatiation of Adults in today's churches, can afford to miss this book! Clearly and succinctly written, Paul Turner underscores that the RCIA is not about making 'converts' out of baptized Christians from other traditions but was intended to be and should be still about the way in which unbaptized people are fully initiated into Christ and the Church. Hence, this study explores in an ecumenically-sensitive way what our common baptism means with regard to rites of reception into full communion. This is an excellent overview of the program that will help pastors to train those who teach or sponsor candidates in the program, or who would like to explain the historical basis for revival of the catechumenate program at the parish level. It should be read by pastors and be on the shelves of seminary libraries. Turner explores theological, pastoral, and ritual aspects of Confirmation that have long been in need of deeper conversation. 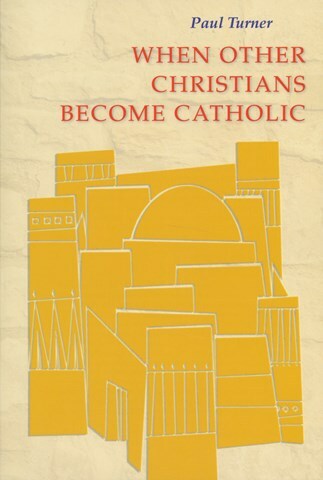 The title tells it all, as this book endeavors to look at how other Christians are received into full communion with the Catholic Church. . . . Readers are listening and are well informed by When Other Christians Become Catholic to further an inspiring vision of Baptism and Christian unity.